Masaya, cried the Ceety o Flouers, is the caipital ceety o the Masaya Depairtment o Nicaragua. It is situatit approximately 14 km north o Granada an 17 km sooth frae Managua. The toun o Masaya is situatit juist sooth o the Masaya Volcano (Volcan de Masaya), an active Volcano frae which the ceety takes its name. The 2005 population estimate wis 146,000. 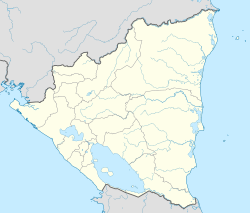 Masaya is locatit centrally tae a lairge agricultural production region in Nicaragua. Muckle o the production frae the depairtments o Masaya an Carazo an the surroondin auries is shipped throu Masaya on its way north, towards Managua an Leon. Masaya is an' a' a notable industrial centre, producin fuitwear an claes. Ither industries in the ceety include the processin o feebre an the manufactur o cigars, leather products, soap, an starch. Mony o the communities surroondin Masaya produce haurdwood an wicker furnitur, an thare is a neighbourhuid in Masaya near the lake dedicatit tae the production o hammocks. Masaya is kent as "the Cradle o Nicaraguan Fowklore" an is the vera hert o Nicaraguan handicrafts. The main mecat in Masaya an is locatit next tae the central bus station. The mercat is dividit intae sections, wi each section servin a different need. Aside frae unique Nicaraguan products sic as haund woven hammocks, embroidered blouses, wid carvins, an hemp weavin the mercat is vera diverse. An entire section o the mercat is dedicatit tae sellin electronic devices an cleidin, while anither aurie is reserved for raw meat. Aathing is available in the mercat frae haurdware an beauty supplies tae produce frae the surroondin aurie. The Mercado de Artesanias (Craft Mercat) is locatit inside what uised tae be the "mercado viejo" (auld mercat), a 1900s structur that is locatit near the centre o the ceety an a couple o blocks away frae the general population mercat. Thir mercat haes been revitalized an set as a tourist spot, whaur crafts frae Masaya an ither auries o Nicaragua can be foond. In addition, ivery Thursday nicht thare is a Noche de Verbena or Nicht o Revelry, whaur folkloric dances are presentit. Masaya is notit for the annual faw fiesta o San Jerónimo, which is ruitit in the Roman Catholic faith o the fowk who celebrate thair patron saint, San Jerónimo. Awtho mony fowk, includin some Nicaraguans, mey consider this event a cultural event athoot pairticipatin in the releegious content, the vast majority are renderin thair devotion tae thair saunt when thay pairticipate in the folkloric dances an ither street processions, sic as the carnivalesque "Torovenado" celebrations, which aften hae groups an individuals who perform satires o local an naitional poleetical figures. This celebration is famous athin the kintra tae the extensiveness (~3 months) an richness o folkloric elements. The historical ceety centre haes open plazas an twa lairge 16t century Baroque airchitectur kirks. Masaya is the maist active volcano in the region. It is actually made up o twa volcanoes; Masaya an Nindiri wi a tot o five craters. The Spainyie first describit the volcano in 1524. Syne then, Masaya haes eruptit at least 19 times. Frae 1965 tae 1979 Masaya contained an active lava lake. The last reportit eruption event at Volcan de Masaya wis in 2003, when a plume reportedly shot ~4.6 km intae the air. Masaya is an unuisual basaltic volcano acause it haes haed explosive eruptions. The eruption in 4550 B.C. wis ane o the lairgest on Yird in the last 10,000 years. Masaya is an aa locatit northwast o a lairge, dormant volcano wi a deep crater lake, "Lago de Apoyo", at its summit. Pairt o the Apoyo Lagoon Natural Reserve, this lake is a popular attraction in the aurie, an is host tae several hostels an sma resorts. Apoyo's crater measures fower miles wide an ower 656 feet deep. It is uised for fishin as well as watter sports. It haes an aa been a location for pre-colonial airchaeological findins. Wikimedia Commons haes media relatit tae Masaya.